Happy Navarathri to all my dear readers! Thank you for joining me in this Navaratri Celebrations. We had been planning on making elaborate preparation for these 9 day long Navaratri Pooja. With the 10th day being Vijayadasami or Dussehra, it is celebrated in different ways in different parts of India. In the south of India, those who follow the tradition of keeping Golu, will celebrate Navaratri by observing the different deity each day personifies. This is also an occasion when they invite womenfolks to home and offer prasadams. New dolls are added every year and kept on display. Kids who attend the golu are given gifts to make it more interesting. We lived in a colony all my childhood, and have fond memories of visiting the neighbors and meeting friends. The prasadam made will usually be sundals made with different lentils, sometimes payasam etc. But we get back home with different sundals which makes it so very interesting as you get to compare the taste and enjoy. As a custom, we normally have grand celebrations on Ayayuda pooja and Vijayadasami. So in 2009, We decided to celebrate these pooja all through the nine days. Since I was in town last year, I missed doing it at home. So I am very happy doing this again this year. Pooja holidays normally coincides with the quarterly exams for kids here. But this year with so much confusion prevailing for the other boards, Konda’s exams are going on now. Boys have their holidays and you can imagine how much of a masti they are having. Coming back to the Navaratri pooja, Navratri is divided into sets of three days to adore three different aspects of the supreme goddess or goddesses. The first three days are for Durga, also known as Kali in order to destroy all our impurities. Neivedyam made on this day will have to be sour and spicy. So for the next three days it will be Tamarind, Lemon and Sambar Rices along with Sundals, Payasam. We can also make Ellu Sadam and Payasam on Saturday. Second three days, the Mother is adored as a giver of spiritual wealth, Lakshmi, who is considered to have the power of bestowing on her devotees inexhaustible wealth, as she is the goddess of wealth. So on these days the prasadam will be Sakkara Pongal, Ven Pongal and Thengai Sadam. The final three days is for worshiping the goddess of wisdom, Saraswati. Neivedyam for these three days can be Sundal, Payasam. So based on what I made last time when I had a reference which said what should be made on each day of the pooja I made those neivedyam. Since I had a list, it was easy for me to just make. So this year I discussed it with couple of elders who are well versed in this and came to this conclusion. Based on what I am told, I decided to make different dishes accordingly. For today’s prasadam, hubby dear had already told me what to make and it was just as what I was told. So it was very nice that it related. He asked me to make Senega badallu Payasam / Bengal Gram Payasam and Pulihora. Amma usually makes Pesara pappu Payasam. When I asked her to tell me a new way to make, she said Athamma is the one who makes this frequently and that I should ask her. Anyway to make the story short, I decided that I should add copra and Gasa Gasa to lend a new taste. Coming to Pulihora, I have already tried all the versions that I know of. So wanted to make with Poha / Beaten Rice for a long time. 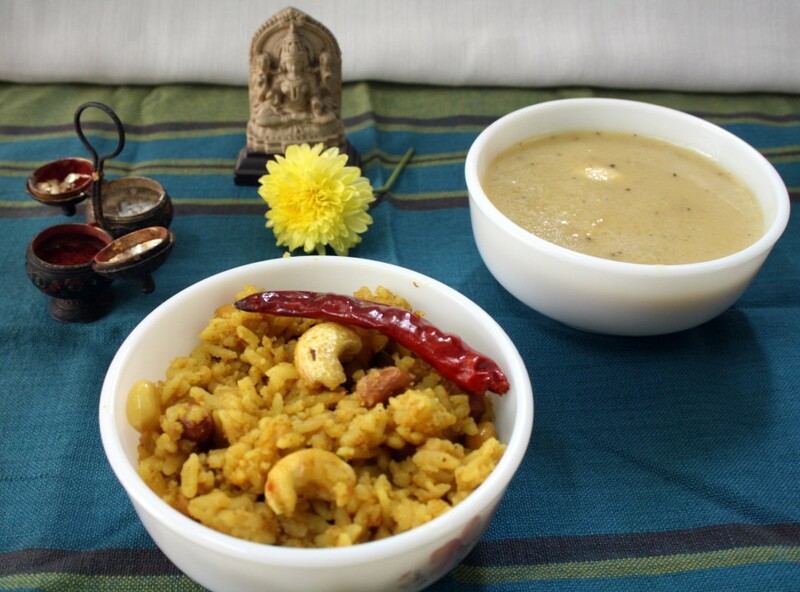 Puli Aval / Aval Puliyodharai or Atukula Pulihora as we might say in Telugu, is a famous version of Poha in Tamil Nadu. I wanted to make it the regular way but had a quick look at the first search that came up and decided that it is indeed made the same way. 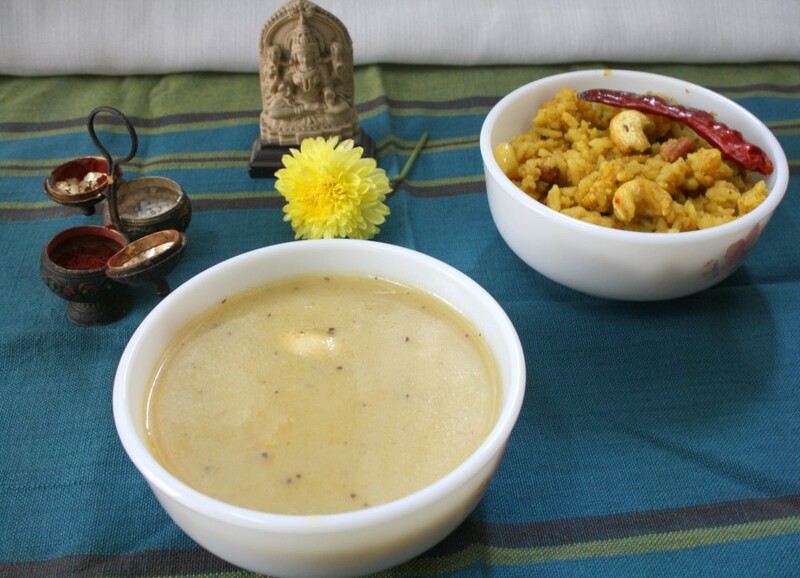 So for the Navaratri Special Dishes Day 1 Prasadam, I made Atukula Pulihora, Senaga Pappu Gasagasala Payasam. Senaga Pappu Gasagasala Payasam is a special flavoured payasam in which you add copra/ dried coconut powdered with Poppy seeds. Both these ingredients are so rich, and takes your payasam to the next level! Though I was hoping on making different Sundals, I had to be content with these two neivedyams. Hoping to make one sundal for prasadam for rest of the Navarati pooja, along with another special Neivedyam. Dry roast the ingredients for the masala, and keep it to cool. Soak the tamarind in water and extract pulp. Add sambar powder, turmeric powder and mix well. Wash the poha couple of times, then add the tamarind water the poha and let it sit for 10 mins. It will bloat well by absorbing the tamarind water. Heat a non stick pan with oil, season with mustard, Urad dal, ground nut, cashew nuts. Fry well. Then add the poha, mix well. Wash and soak Bengal Gram for 10 mins. Then pressure cook with enough water to soft texture. Once the pressure falls down, add the boiled milk. Powder the dried coconut and poppy seeds to a semi smooth powder. Heat the cooked dal and when it starts boiling add the powder. Happy NAvarathri wishes, puli aval and payasam looks excellent and delicious..